For this weeks Top 10 In Craft, it’s all about Rainbow Crafts! Fun and colorful crafts that bring fun and joy. Lots of variety to get your creativity flowing. There is a crocheted Spiral Rainbow Dream Catcher that looks gorgeous. The Rainbow Triangle Pillow that will bring color to your couch or outdoor chair. This week I have been creating a smaller version of the Knitted Cable Cloth. I have some leftover purple yarn, and I really enjoyed making the pattern. Simple to do and it does not require a cable needle. The next project is the Wavy Rib Dishcloth by Knit Picks. With St Patrick’s Day coming up Knit Picks has a sale of heaps of their Green Yarns. Create your own version of this beautiful craft with the help of Julia Stanfield on Ravelry. Take a look at the video here for all the wonderful Rainbow craft ideas from Maggy at Red Ted Art. Victoria Stott from String Theory Crochet has some fabulous suggestions for this gorgeous craft. Find all the details for this fabulous craft project by Alicia from Sew What Alicia here. All the details for this crafty pattern by Linda Robertus in her Blue Jacaranda Etsy Shop. To create this craft project by Tonya from The Crafty Mummy follow the instructions she has given. This video features some great ideas for Rainbow Crafts! Plenty of inspiration to be found here from Danielle Gillespie-Hallinan from Moose Mischief. Follow the instructions by Rachael Gander from Imagine Gnats here. Super fun to make Mandy from Sugar Bee Crafts. You will be super excited to create this beautiful craft by Catherine Groppoli from Mini Eco. Holly Homer from Kids Activities has created clear and easy-to-understand instructions to help you make this craft project. Just looking at this idea will make the kids want to get out their crafting supplies! Find the inspiration Shelah from Mosswood Connections here. Devany from Still Playing School shares their experience and tips for how to make this craft project. Tammy Dube from Housing a Forest shares the information here. To create this craft project follow the instructions Michelle from Crafty Morning. 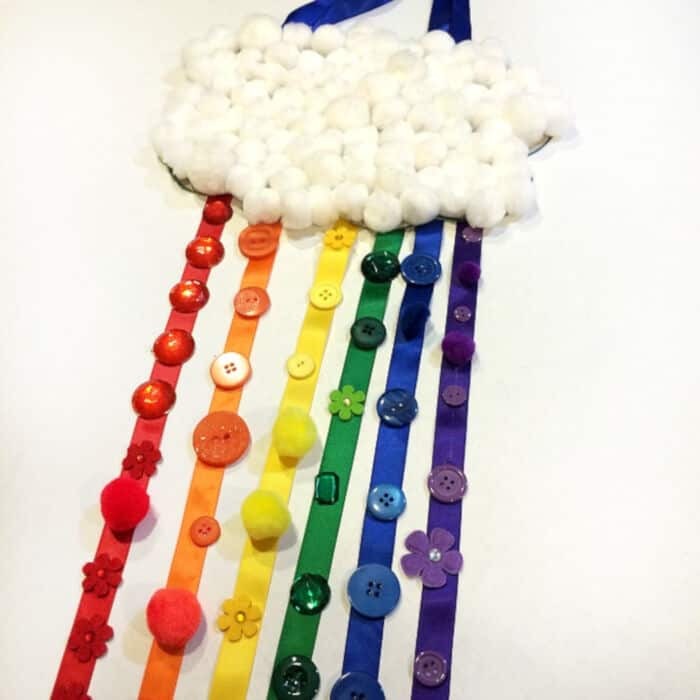 A simple Rainbow Craft for Kids ! Read all the details here by Marie LeBaron from Make and Takes. Anthea from Blue Bear Wood steps you through the techniques used in this brilliant project. A really wonderful idea, this craft Andreja Vucajnk from Easy Peasy and Fun makes use of some great materials. Krissy from B-Inspired Mama gives great step by step instructions on how to make this gorgeous craft. Get the kids involved with this fabulous idea. Follow the tutorial Justine from The Typical Mom. Sara from Sunshine Whispers makes this look very easy! Agnes Hsu from Hello Wonderful steps you through how to put it all together. What an incredible idea, I definitely want to do this one with my youngest. Amber from From ABCs to ACTs steps you through her crafty idea. Ellen from Paper and Glue provides all the details for this crafty project. Katie from Preschool Inspirations has done an excellent job, find the complete guide here. Ana from Babble Dabble Do has created this beautiful project for you to follow. Following the steps for this craft project will be a breeze. Check out the guide Michelle from Crafty Morning here. Danielle from Fun Learning for Kids has some excellent crafty ideas, which you should try out. Andreja Vucajnk from Easy Peasy and Fun makes it look so simple. Bring some easy and amazing crafty goodness into your life with craft Leanne Guenther from DLTKs. Kimberly from A Night Owl steps you through the requirements to make these very creative ideas. Thanks to Lauren from Daisy Cottage Designs. What fun it will be to create your own version of this craft project with the expert assistance of Cheryl from A Pretty Cool Life. What a gorgeous handmade project made possible by the creativity of Melissa from Fireflies Mud Pies. Tammy Dube from Housing a Forest has some excellent suggestions for this crafty idea. Find all the details, including materials and easy to understand steps for this great craft project by Rachel from I Heart Crafty Things here. What you need for this wonderful craft project Agnes Hsu from Hello Wonderful are outlined in her post. Creating this fun craft project Heidi from Happiness is Homemade and follow the easy to follow instructions she has given. Kids are sure to be excited to make their own version of this inspiring craft. The instructions to follow Andreja Vucajnk from Easy Peasy and Fun are here. Super fun to make craft idea by Rachel from I Heart Crafty Things. Your creativity will be flowing when you create this beautiful craft by Allison McDonald from No Time For Flash Cards. The team from Fun Littles has detailed clear and easy-to-understand instructions to help you make this craft project. Melissa from Fireflies Mud Pies shares their knowledge and helpful tips on how to make this craft project. Emma from Kids Craft Room shares the information here. I am sure your kids will enjoy making this craft project. Follow the step by step instructions Helen from Arty Crafty Kids. Get your crafting supplies ready and create this lovely craft. Read all the details here from Planning Playtime. Nell from Rhythms of Play steps you through how to make this funtastic project. A superb idea, this craft Amanda Formaro from Crafts by Amanda makes use of some great materials. Maggy from Red Ted Art gives great tips and tricks on how to make this fun craft. Follow the tutorial Andreja Vucajnk from Easy Peasy and Fun. Jackie Currie from Happy Hooligans makes this look easy and fun to do! Melissa from Fireflies Mud Pies steps you through how to put it all together. Jennifer from Sugar Spice and Glitter steps you through her crafty idea. Meaghan from The Decorated Cookie provides all the details, including materials and how-to tips for this crafty project. Amanda Formaro from Crafts by Amanda has created this sensational craft project for you to follow. Check out the guide from De Tout Et De Rien here. Anna from The Imagination Tree has such talent, find the complete guide here. Amanda Formaro from Crafts by Amanda has created this awesome project for you to follow. Michelle from Crafty Morning has some fab crafty ideas, which you can try out. Find all you need here from Planning Playtime. Bring some amazing and satisfying crafty goodness into your life with craft from Steam Powered Family. Jennifer from Sugar Spice and Glitter steps you through the instructions and provides ideas for materials to make this very creative idea. Thanks to Amanda Formaro from Crafts by Amanda. Hope you found a fabulous Rainbow Craft project to try out. I’m sure plenty of other people would love the joyful rainbow crafts.